Every few weeks Internet dating site OkCupid uses the power of anonymized data to share a few truths about the online dating scene and human nature in general. To be sure, these reports are often highly controversial and aren’t going to be showing up in scientific literature any time soon, but they’re generally interesting (and often amusing) reads. 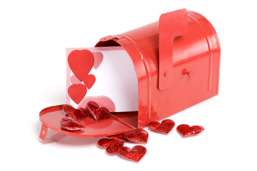 The latest report to come out addresses ‘Your Looks And Your Inbox’, charting the number of messages users receive in relation to how attractive other members rate them. Some of the conclusions aren’t surprising. 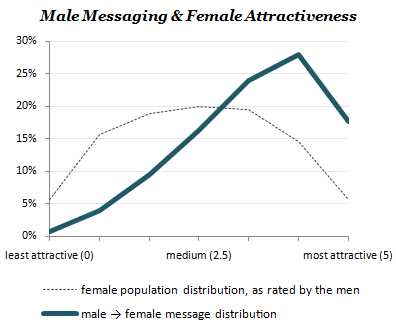 The “most attractive” women receive five times as many messages as the average female does, with 2/3 of all male messages going to the top 1/3 of women. 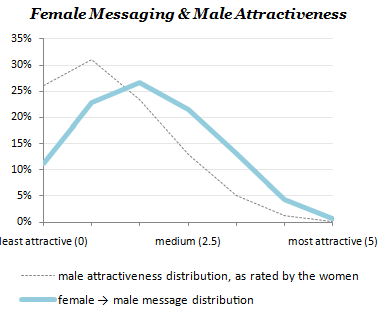 And women tend to favor the most attractive men, though the ratio is less extreme. But there are a few interesting phenomena. For one, men on the site tend to be more generous than women when it comes to rating attractiveness, leading to a nice bell curve with the bulk of ratings falling around ‘average’. But despite their fair ratings, they tend to ignore many of the women they find reasonably attractive and primarily target the most attractive females. Women, on the other hand, are harsh with their ratings. According to the study, they rate a whopping 80% of men on the site as ‘below average’. My first guess was that there was an issue with self-selection here (i.e. unattractive men congregate on the site for whatever reason). But the study includes photos of four pretty normal looking guys who were all rated to be unattractive. And perhaps more telling: women don’t seem to be opposed to actually contacting these men that they’ve just deemed unattractive. That last bit seems like a stretch (women could just as well have more interest in a man’s personality/profile than his photo). But an interesting trend nonetheless. For more, including the message open rates as they vary by attractiveness, check out the OkCupid post here.